Enhance your curls with the label.m Curl Define Souffle, an ultra-nourishing, soft cream wax that works to lock in moisture while enhancing, smoothing and conditioning your curls. 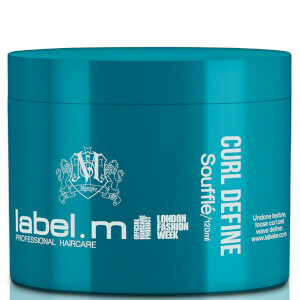 Formulated with a protective blend of Avocado, Barbados Cherry and Olives, the curl-defining hair wax promotes loose, glossy curls and waves while providing instant volume, definition and undone texture. Fortified with label.m's exclusive Enviroshield Complex, which shields against heat styling and UV rays while enhancing shine. Free from sulphate and sodium chloride. Apply with fingertips onto damp or dry hair. Reapply for added definition.